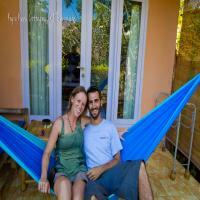 We are Jen and Matt, a French/ American couple living in Indonesia for many years. We would love to show you the real Indonesia! Ask us anything about your travel plans here in the most incredible Indonesian Archipelago. What is this?The response rate represents how often, on average, this owner responds to inquiries. What is this?The acceptance rate represents how often, on average, this owner accepts reservation requests. A promo code is a special discount that may be available for this property. Contact the owner for details. There is not much in the way of shops, so stock up on essentials at one of the many shops or markets on the road to Gangga. If there is something special you would like prepared from you, let us know beforehand, or pick up your own ingredients from the market on your way to the waterfall. Check in and check out times can be flexible, unless there are guests arriving/departing the same day, in which case check in will be from 2pm, and check out will be at 11pm. This is a Lombok home stay experience, Although we do our best to make the cottages clean and comfortable, Gangga Bungalows is an authentic experience in a rural setting, and not a necessarily a hotel. We ask for your understanding and respect for the traditions and ways of rural life in Lombok. We hope you enjoy your holiday at Gangga Bungalows in Lombok! If you need to cancel, please do so ' + policyDays + ' or more day' + s //	+' prior to check-in or you will be charged a ' + policyRate + '% cancellation fee. If you cancel before the owner/host has confirmed the reservation, there is no cancellation fee. Note to Owner/Host: If you change your cancellation policies, any previous reservations will be held to the original cancellation policy that you had in place when the reservation was confirmed. CrashMyPad service fees are NON REFUNDABLE on all types of cancellation policies (Minimal, Intermediate, Maximum, No Refund, and Custom cancellation policies). Cleaning fees are refundable if the guest did not check in. If there is a complaint from either guest or owner/host, you must contact CrashMyPad within 24 hours of check-in. A reservation is not cancelled until the guest has received a confirmation of cancellation email from CrashmyPad.